As the press service of the Donetsk People's Republic’s Head reports, Alexander Zakharchenko, inspected one of the ‘hot spots’ in outskirt of the Donetsk capital, the so-called “Volvo-centre”. This is one of the possible directions of the AFU and terrorist battalions' strike. 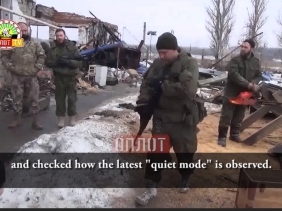 Alexander Zakharchenko discussed with the soldiers the current aggravation of the front line and checked how the latest "quiet mode" is observed. 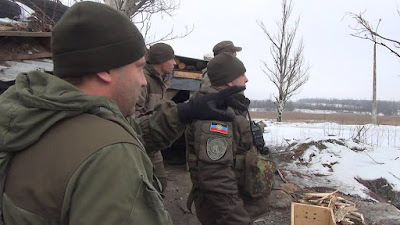 During the Republican Head's visit at the forefront, at first it was quiet, but before his departure two mines launched from the Ukrainian positions exploded near the positions of the DPR People's Militia. As the Head’s press service notes, Alexander Zakharchenko was once again convinced that it is impossible to believe the Kiev regime and he urged the soldiers to remain vigilant – provocation by the AFU can happen at any time. On the way to the frontline, the DPR Head visited the wounded treated in the republican trauma hospital and those injured during the latest AFU attempt to break through the defensive positions of the DPR. In the hospital Alexander Zakharchenko spoke with the wounded, made certain in the treatment, discussed issues of employment and provided them with financial assistance. Besides, the Head of the Republic visited the “Privokzalny” market in Donetsk, which was in the hitting area of the Ukrainian projectiles on February 3. Restoration works are still being carried out there. Several pavilions were completely destroyed as a result of the shelling. Fortunately, there were no customers in the market in the late evening, only entrepreneurs’ goods were damaged.